We collaborate with school administrators and staff to impact and alter the student experience. The Equity Leader Labs (ELLabs) convene our partner districts’ and schools’ Equity Team members to develop and adopt the policies, practices and mindsets to sustain equity in support of historically marginalized student success. The ELLabs is an important component in developing extraordinary leaders and is a portion of the A4E: Extend Equity phase. EOS assumes that all ELLabs participants have successfully implemented the EOS program and continue to utilize EOS’ data tools at their school. ELLabs convene educators to experiment with new ideas and strategies. A laboratory incubates experimentation, growth and learning and is long overdue in education. It is easier to repeat what we did yesterday, than to be bold and creative about what is possible for us to do tomorrow. 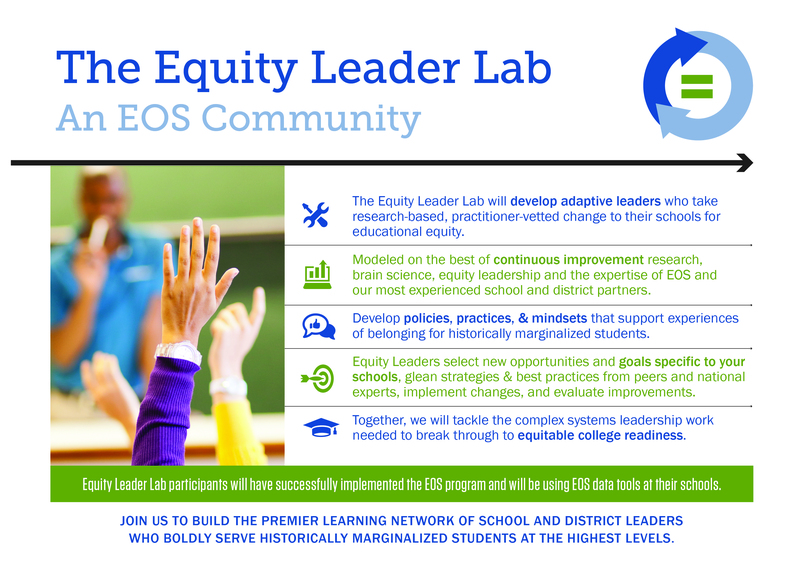 The Equity Leader Labs give you the skills and opportunities to enshrine a higher sense of what is possible for students of color and low-income students in your school system. Share learnings from across our national portfolio. Create space for learning and experimentation in support of equitable opportunity and success. Focuse on policies, practices and mindsets that facilitate equity. Lead by doing the hard work of asking “why not?”. Together, we will tackle the complex systems, leadership, and work needed to break through to equitable college readiness. The Equity Leader Lab is for district and school leaders, across all disciplines and functions, who are committed to equity in advanced level college prep courses. The ELLabs is for district and schools that have partnered with EOS for at least two (2) years. District and school participants have made significant progress towards closing their equity and opportunity gaps, and are prepared to implement policies and practices to sustain their work towards equity. For additional details on role descriptions. and to find, experiment and adopt new ways of working on behalf of students of color and low-income students. You want to change and improve the way you serve students of color and low-income students. You want to lead in progressive and stimulating methods that inspire change. You believe equitable learning opportunities are an urgent and pressing need. The ELLabs convenes four (4) times a year and includes work in between sessions. EOS assumes that all ELLabs participating schools continue to facilitate use of EOS tools and resources at their site–including but not limited to surveys, outreach, advocacy and enrollment of historically marginalized students. The sessions will generally consist of pre-assigned work in preparation, a speaker or facilitator to set the foundation for the day, team breakout work-sessions, full-group developmental activities, and open floor conversations. Each session has been designed to touch on a specific and identified topic, based off of thousands of past partnership visits and communications. The sessions each represent an area of importance in the journey towards a sustainable equity program. ELLabs’ sessions have a designated topic to be covered, leading to collaboration in the form of job-alike work groups, expert-led discussions, and open forums. Each cohort will have the autonomy to structure the session to best meet the needs of the participants. The sessions will generally consist of preassigned work, a speaker or facilitator to set the foundation for the day, team breakout work-sessions, full-group developmental activities, and open floor conversations. This session prepares staff to return to their schools to facilitate implicit bias activities with their peers. Participants engage in a retrospective on their school’s multiyear journey with EOS to expand access and opportunity for students of color and low-income students and set goals for the year, including enrollment targets for AP/IB coursework. Developmental Activity: In between session #1 and #2, participants facilitate one of three implicit bias activities with a group of their peers. This session dives deep into the unique experiences of students of color and low-income students, as well as an overview of relevant belonging and learning research. Participants explore the dynamics of belonging rich learning environments and have opportunities to explore how these environments are or are not present in their AP/IB classes- using EOS Survey Data. Developmental Activity: In between Session #2 and #3, participants engage in a half day student shadow. This session prepares participants to engage in tests of change to improve policies, practices and mindsets that sustain and extend equity. Participants explore to core concepts of continuous improvement and select a 6-week test of change related to their school’s unique equity journey. Developmental Activity: In between Session #3 and #4, participants engage in ‘tests of change’ explore and improve their equity eco-system. This session engages in strategic planning for equity. Participants reflect on the existing year, evaluate outcomes, assess improvement projects and look ahead to next year. Participants create action plans to ensure success continues and to continue to remove roadblocks that impede equitable access and opportunity. Developmental Activity: Reflect on the past year and how you can apply the learnings to your classroom, school, district and colleagues. The Equity Leader Labs will be located regionally, across the US. As additional partner schools graduate to this service level, new ELL cohorts will start-up each Fall. These regions have been selected to host for the 2019-20 ELLabs cohort year. Specific dates and locations are being finalized and will be shared with those districts and schools, in near proximity, if eligible for the Extend Equity phase. If your district would like to be considered for participating in or host an ELLabs cohort in 2019-20, please contact us. You can use this form to identify potential participants from your district and schools. If interested in joining us to build the premier learning network of school and district leaders, who boldly serve historically marginalized students at the highest levels, then contact us to learn if your school is eligible to join and ELLabs this year. What ELLabs participant are saying.